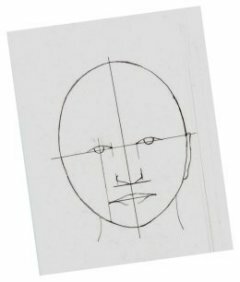 The first thing to look at when learning how to draw heads, are the general proportions of the human skull. These are important guidelines for you to follow, but remember they are only guidelines. Despite the similarity in the human face, each person’s features are unique. 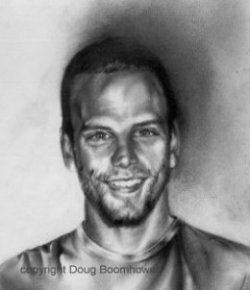 Therefore, when drawing you will constantly be facing variations of facial proportions. Another important thing to remember is that nobody’s face is symmetrical. In other words, the left and the right side of a person’s face are not exactly the same. Those differences vary from person to person. 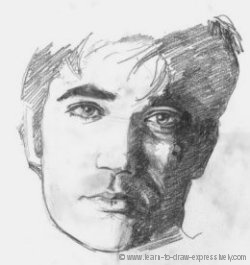 A weakness that beginning artists fall into is trying to make both eyes exactly the same, both sides of the mouth exactly the same, or both ears exactly the same. This is just not the case in real life. There are very few “Ken and Barbie dolls” walking around! A person’s head is generally oval-shaped. It is then divided down the middle (#1) and horizontally (#2). The eyes will fall along line #2. 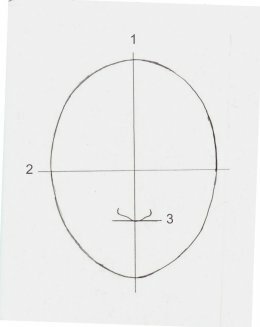 The base of the nose falls half way between line #2 and the bottom of the oval (Line #3). The middle of the nose falls on the vertical dividing line #1. 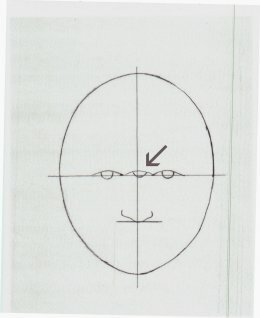 Line #2 passes through the center of the eyes. 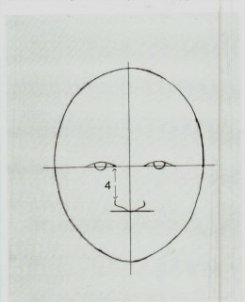 The corner of each eye lines up with the sides of the nose indicated by #4 on the right illustration above. 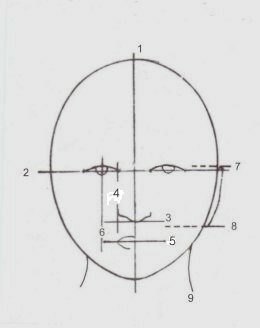 (Line #5) that is one-third the distance between the base of the nose and the bottom of the chin. You don’t have to take out a ruler and calculate precisely one-third. You can simply “eye-ball” it. 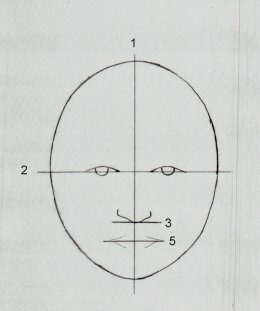 The width of the mouth extends so that it falls directly under the center of each eye, as indicated by Line #6. Line #7 and line #8 indicate the placement of the ear. Note that the top of the ear is just slightly higher than the center line of the eye. 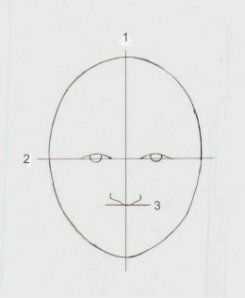 Line #9 shows where the neck connects to the head. Note that the connection point falls directly beneath the outside of each eye. Don’t be puzzled by line #2 which divides the oval in half. 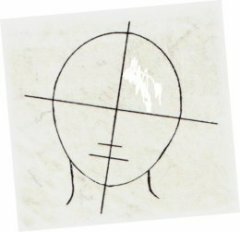 Because all of the facial features (eyes, ears, nose, mouth) fall on or below this line, this division may not appear to be in the right place. However, this is the correct division. Another thing to keep in mind is that these are the proportions of the human skull. The hairline has not been taken into account. Once a person’s hair is added, (long hair, short hair, curly hair, etc.) these proportions may appear to change. 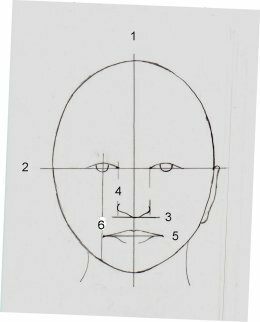 However, experience will teach you that the head proportions in the diagram are correct. When the head is tilted the proportions are still the same. 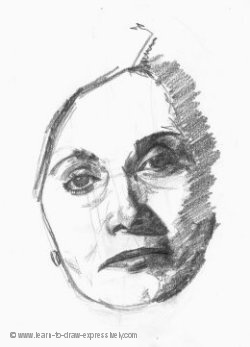 This pencil drawing was done quickly during a practice session, but it indicates the facial proportions. The chin appears long in this portrait because of the beard. I was commissioned to do this drawing. This is from a drawing exercise. 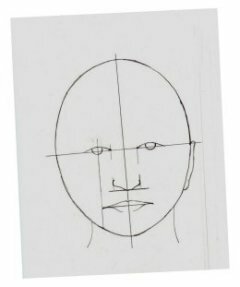 Understanding these general proportions will give you a solid basis when you are learning how to draw heads and faces.